One of the world’s great natural wonders, The Belize Barrier Reef, running some 190 miles (300 km) along Belize’s Caribbean coastline, is the largest reef system in the northern hemisphere, and the world’s second largest after Australia’s Great Barrier Reef. Along with some of the planet’s largest atolls, the reef supports diverse, vibrant marine habitats, shelters hundreds of small islands, locally known as cayes, and provides protection for Belize’s Caribbean coast. 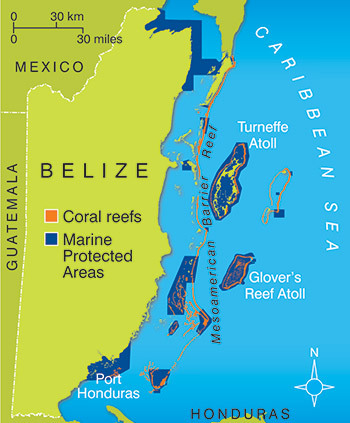 Together, the seven marine protected areas, the shelf lagoon, offshore atolls and coastal habitats all constitute the Belize Barrier Reef Reserve System, or BBRRS. As the largest barrier reef system in the northern hemisphere, it’s size, geographic spread and diversity makes for a vibrant ecosystem that supports an astounding number of species, including corals, fish, shellfish, sponges, tunicates, birds, marine mammals and other life forms, giving the BBRRS the highest levels of marine biodiversity in the Atlantic and Caribbean.